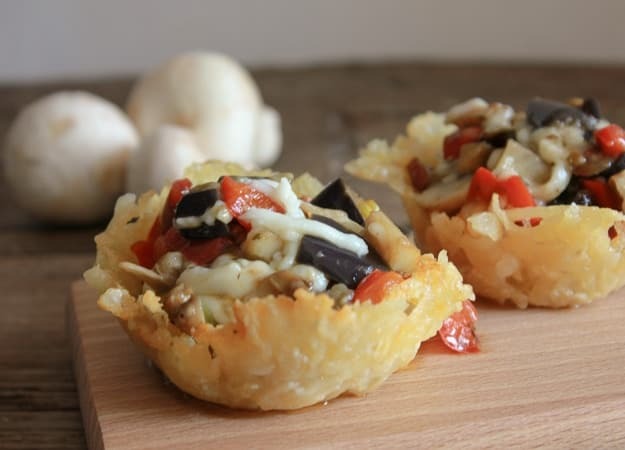 Stuffed Potato Parmesan Cheese Baskets, the perfect healthy, fast and easy year round Vegetarian Appetizer Recipe. Change it up by filling with your favorite in season veggies. When I discovered Parmesan Cheese Baskets, I decided that this would be the perfect Appetizer for me. I would fill it with some sautéed summer vegetables and everyone would be happy. So there is no denying it, my favourite cheese hands down is Parmesan. I could eat this stuff in chunks and I do! Unfortunately not to be. There were two members of this family (they will not be named,) who thought that Parmesan cheese was way too strong for their liking. I was given the idea of adding some shredded potatoes. So I took the suggestion and I ran with it. 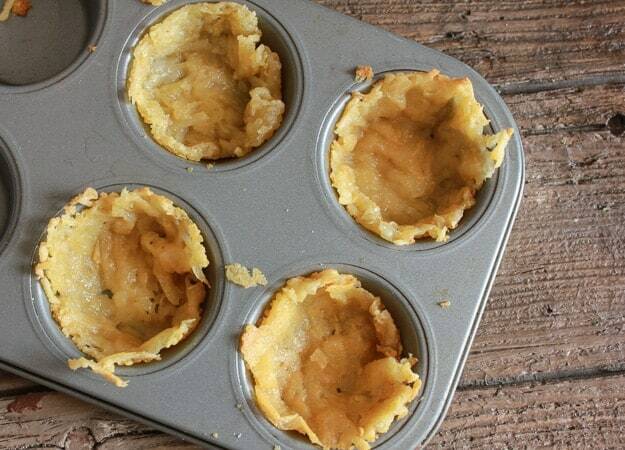 That is how I came up with Stuffed Potato Parmesan Cheese Baskets. 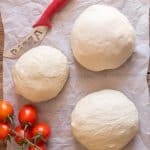 Great idea the Italian has sometimes! Actually he is my go to recipe critic. If he eats something in silence then I know it’s a hit. If not he is always good for some terrific advice and back to the stove I go. Or we have some pretty good debates on what goes or doesn’t go! Seriously these pureed Stuffed Potato Parmesan Cheese Baskets are incredibly delicious. One of the best appetizers I have ever eaten. 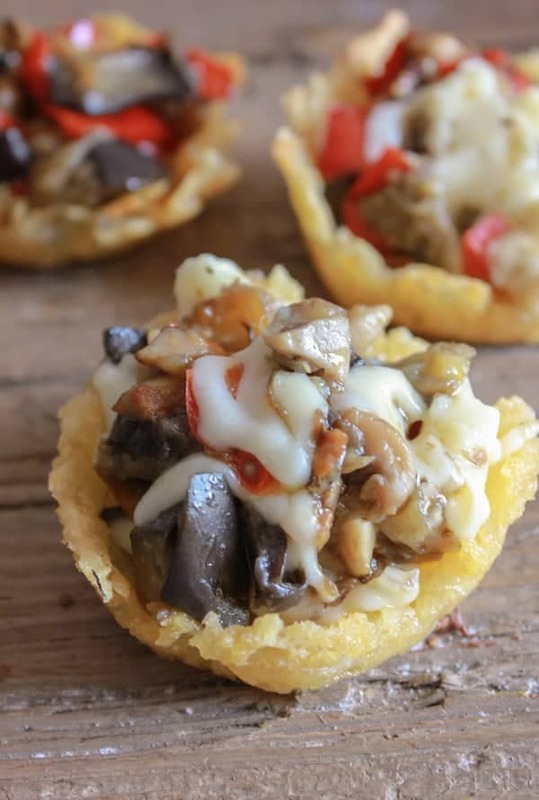 More Delicious Appetizers you may enjoy! One of the unnamed family members was quick to grab a second helping so I guess she liked it too. I sautéed some chopped pepper, eggplant and mushrooms together with some spices (I can never forget the hot pepper flakes for my husband), but you could probably pick and choose your own favourites. While the veggies were cooking I shredded my potatoes extra fine (so that they cook quickly) and mixed it up with freshly grated Parmesan cheese. Nothing to making these Parmesan Cheese Baskets, place a couple of tablespoons of the Parmesan/Potato mixture, flatten into a circle and fry until golden. 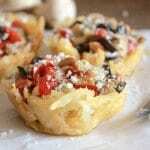 Using a muffin tin is the perfect way to form them into baskets. I then filled them with some sautéed veggies and they were enjoyed by all. Buon Appetito! 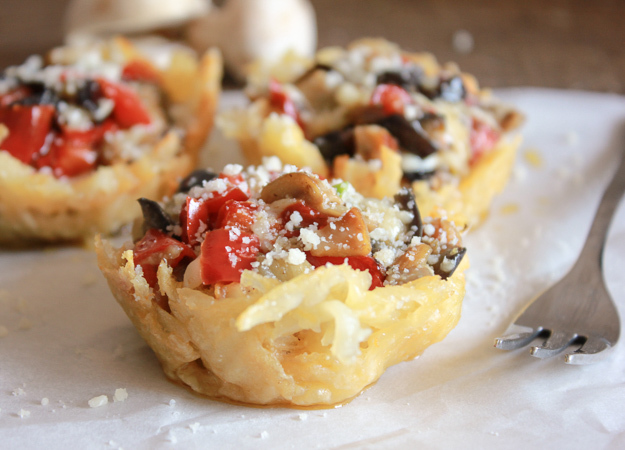 Stuffed Potato Parmesan Cheese Baskets, the perfect healthy, fast and easy year round appetizer recipe. Fill with your favorite veggies. In a medium bowl toss well together, the well dried finely grated potatoes and Parmesan cheese. 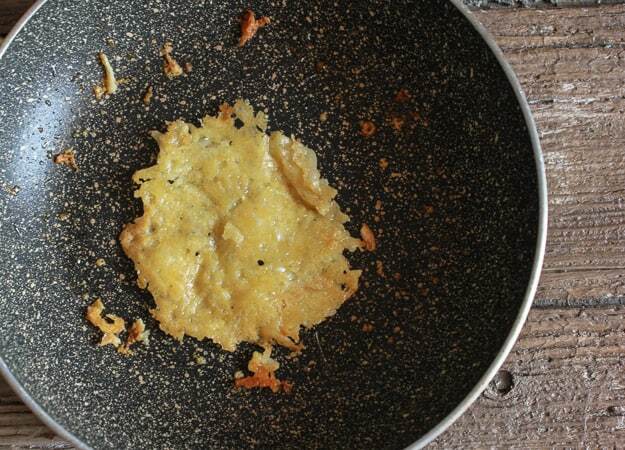 In a small non stick frying pan over medium heat add approximately 2 tablespoons of Parmesan mixture and with the flat end of the spoon spread to form a circle, carefully flip circle over with a fork, (do not use a plastic utensil the cheese will stick) cook until golden on both sides. 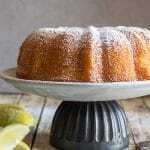 Place circle in a muffin tin (gently push with a small spoon into the muffin tin) continue until all baskets are formed. Let sit in muffin tin for 2 minutes and then move to a wire rack to dry 2 minutes. 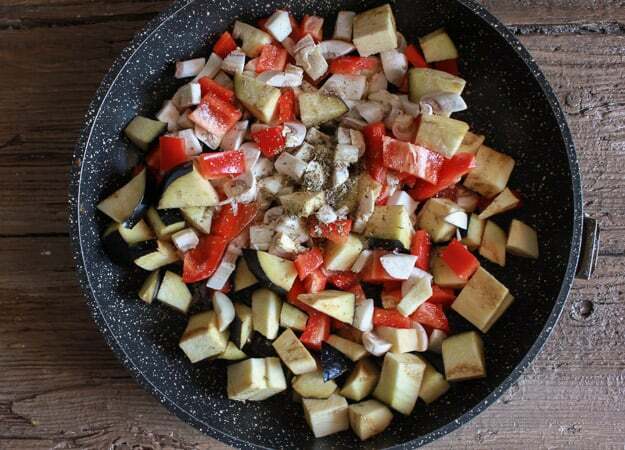 In a medium pan add olive oil, diced eggplant, pepper, mushrooms, oregano, salt, parsley, hot pepper flakes and water, cover and cook over medium heat until water has evaporated and veggies are tender. 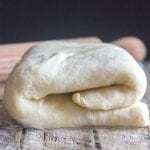 Let cool slightly then toss with 2 tablespoons of shredded firm mozzarella or Gruyere cheese. Fill with veggie mixture and serve immediately. Enjoy! i’m not a big fan of egg plant. Is there another suggestion, maybe? Hi Edie, well you could always leave them out and just add some extra mushrooms or peppers, or add some zucchini, squash, maybe a cut up tomato (seeds removed, add towards the end), hope that helps. Have a great weekend. Can you make the baskets the night before serving? Hi Karen, I wouldn’t advise making the baskets the night before, because of the moisture in the cheese would probably soften up the potatoes too much. I love the presentation of these. And based on the ingredients, I’m sure they are delicious! Pinning for later. Thank you for sharing on #HomeMattersParty. Hi Sonja, thanks very much. I found you on #HomeMattersParty, btw. Hi Carla, thanks so much, hope you enjoy them. Have a great weekend. They look delicious and I think you could put just about anything in them and come out with a winner. Appetizer?? I could make that the entire meal. 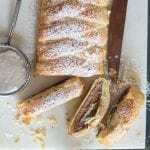 In fact, I thought for sure you’d say that one of your family members insisted on Nutella as the filling 🙂 Great recipe and pictures!! Buona giornata!